I enjoy reading a mix of fiction and fantasy to simply lose myself in the story. The other part of my brain craves improvement and knowledge. I recently picked up a book by Jordan Ring called Volcanic Momentum. There is something to be said for a book that pushes you to become a better you. This is one of those books. 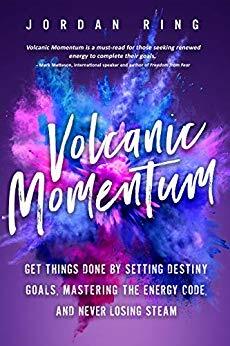 Of course he covers goals, because no self-improvement book would be complete without goal setting, but then he also outlines 9 strategies to master your momentum. He also adds additional material for support on his website. Ring really wants you to succeed! I had never before thought of what my legacy in this world would be (other than my wonderful daughters). Ring calls it your Destiny Goal. I never felt important enough to touch other people. I now realize that I’m only limiting myself with this thinking. Starting out with a Destiny Goal is a huge leap for anyone. Ring breaks it down into smaller and medium size goals. Those I can grasp easier and have been working on for years. It is a tried and true path to success that many people write about. One new tidbit I picked up was the idea of having a focus word. Starting with ten words, then narrowing it down until you find the one word that all your goals should point to will help keep you on track. I think mine for this year will be “known.” While I have been working diligently on my lists, goals, and self-improvement, as a writer, it’s time to push my books to the next level. Someday I would like my name to be known as a writer with strong female protagonists and role models for young readers. I often liken my Lady Tigers series to books written by Matt Christopher. He was one of my favorites in elementary school. He wrote over 100 books about various sports…but they were boys’ sports mostly. His books filled the shelves in the library and they were the first place I would go during library time. I would love for my Lady Tigers to reach that level and be the inspiration for young female athletes. And why not? Maybe that should be my Destiny Goal as well. Getting “known” will help me reach my destiny. Thank you, Jordan, for pushing me to the next level.